Roy Moore’s easy victory in Alabama’s Republican Senate runoff says something about President Donald Trump, who tried and failed to sell Moore’s opponent to the party base. But it says a lot more about the toxic disconnect between the GOP's Washington establishment and its grass-roots voters. That's a far bigger story, with implications for the 2018 midterms, Trump's re-election, the futures of Senate Majority Leader Mitch McConnell and Speaker Paul Ryan, and maybe even the nature of politics. 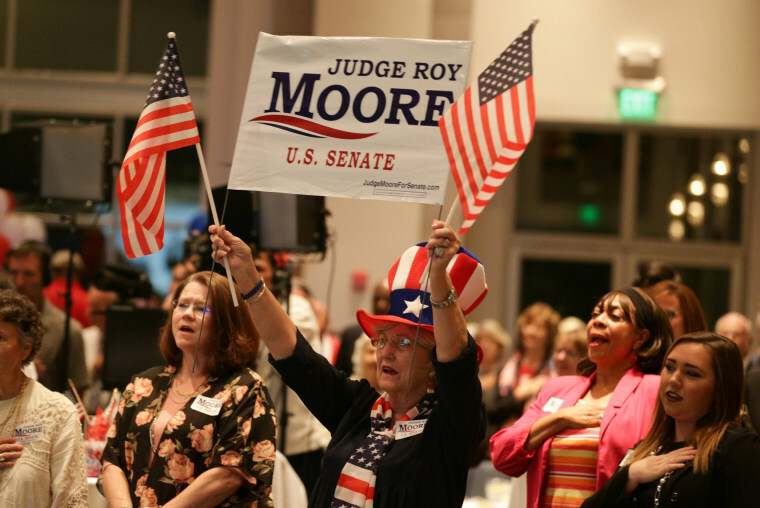 Moore's win is best viewed in the context of a series of uprisings within the Republican Party that began during Barack Obama's presidency. The circumstances have varied, but the pattern is consistent: candidates who would once have been easy to dismiss as marginal figures knocking off impeccably credentialed men and women of the establishment in primary elections. The first wave of them began in 2010, with Christine O'Donnell in Delaware, Joe Miller in Alaska and Rand Paul in Kentucky. Two years later, it was Richard Mourdock in Indiana and Todd Akin in Missouri. There were others, too, and not just in Senate races. The turmoil was traumatic for national Republicans. The insurgents complicated the party’s prospects in major races, and in some cases handed victories to Democrats. They also injected fear into GOP incumbents — they might be the next victims of what was labeled the Tea Party rebellion. The establishment scrambled to understand the anger. If its leaders could just translate it into a legislative program, then they'd restore order within their party. The task looked simple enough. Tea Party rallies were attacking Obama's stimulus and health care programs and highlighting the rising national debt. The movement seemed to have a libertarian bent, animated by the size of government and a sense that Republicans weren't doing enough to contain it. So Republicans in Washington redoubled their opposition to Obama and his programs and pushed for spending cuts. The 2014 primary season was calmer, but there was a glaring exception: Eric Cantor, the House majority leader, was ousted in a surprising primary upset in his Virginia district. The party establishment was doing a better job fortifying itself with the traditional tools of politics, but deep grass-roots restiveness remained. It was that restiveness that Trump rode to the Republican presidential nomination in 2016. His platform, to the extent he had one, violated much of the conventional wisdom about the Tea Party movement. He wasn’t fixated on the size of government and talked of protecting Social Security and Medicare. He advocated repealing Obamacare, but separated himself from the GOP field by insisting government did have a role to play in protecting people. He also showed protectionist instincts on trade. His overlap with the GOP base was on cultural grounds — the wall, the Muslim ban, thumbing his nose at "political correctness." And there was his posture of antagonism toward the party establishment. He did nothing to cultivate support from elected officials, and didn’t receive his first endorsement from a member of Congress until after he won the New Hampshire primary. Even then, they only trickled in. More than that, Trump reveled in provoking the establishment, and conveyed indifference to its disgust at his culture-war politics. The term Tea Party was fading out, but he'd cracked its code. The power of his appeal was not rooted in policy or ideology. He was offering, as David Brooks wrote this week, "to shred the dominant American culture and to give voice to those who felt voiceless in that culture." And not to give a damn about the party establishment or the conventions of politics along the way. It got him the GOP nomination and just enough converts in the Rust Belt to eke out an Electoral College win. This is why his presidency has produced no meaningful legislative feats. The commitment of the Trump base to doing away with Obamacare is mainly attitudinal. The legislation Republicans have come up with has generated, at best, a lukewarm response from GOP voters — and wide disapproval from the rest of the electorate. Trump himself has seemed detached from and uninterested in the process, as if he senses that legislative sausage-making might rebrand him as exactly the kind of politician he ran against. Meanwhile, Trump throws himself with abandon into culture-war battles, as he’s now doing with the NFL, and he accuses the GOP’s congressional leaders of failing him. It leads pundits to scratch their heads. How will he ever rack up actual accomplishments if he’s alienating the legislators he needs to pass bills? The Trump base doesn’t seem to want those kinds of accomplishments, though. Consider what just happened in Alabama. Trump sided with Luther Strange, the appointed incumbent and favorite of the GOP establishment. It was an awkward match but Trump’s pitch was loyalty: "Big Luther" had pledged his unblinking support for the Trump legislative agenda, starting with the Obamacare replacement bill. By contrast, Moore declared himself against that same bill, but insisted it wasn’t an act of defiance. He was offering himself as a different kind of Trump loyalist — the kind of who would curb the influence of McConnell and the Washington insiders and allow Trump to be Trump. In that sense, Moore's appeal is very similar to Trump's. He’s positioned in fervent opposition to the party’s establishment and draws his identity from cultural politics of a variety even more inflammatory than Trump's. Strange was offering Alabama Republicans a Capitol Hill-ized version of Trumpism, but it was the Moore model they wanted. Potential insurgencies just like this now loom for Republican incumbents in next year’s midterm primary season. Sen. Jeff Flake in Arizona has to worry. Sen. Dean Heller in Nevada, too. Maybe Sen. Roger Wicker in Mississippi. Tennessee’s Bob Corker, a fixture of the establishment, just decided to walk away. As in 2010 and 2012, there could be unlikely opportunities for Democrats to capitalize and make gains they never expected. It could be a moment of reckoning for the leaders of Washington’s Republican establishment. For nearly a decade, they have strained to channel the base's energy into a unifying platform. But it may be that all the base has ever really wanted was for them to be gone — all of them.